The official blog of TalkShop Consultancy - the choice coach of leaders who aim to coach other leaders. GRACIO MED PHILIPPINES share their learning experiences from TalkShop's Social Graces and Fine Dining Workshop. I'm giving an excellent rating for TalkShop from the program to the Consultant and transformative effect. 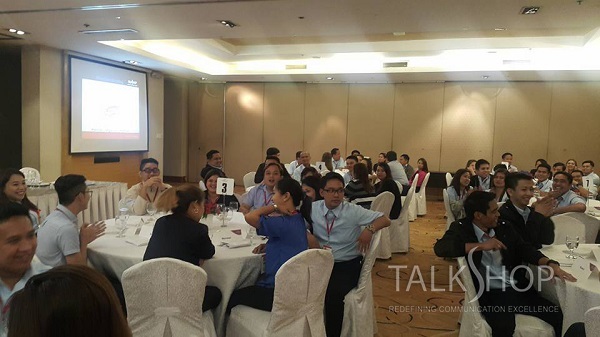 I am proud to have attended this TalkShop workshop to boost my confidence that I can use in daily activities. I am glad I can also teach all the topics I learned to my children. The program design is excellent with an excellent Consultant, Ms. Sheila Viesca who clearly explains the etiquette. It is a well-done workshop by TalkShop. I like the sandwich approach and the design is excellent. TalkShop’s Trainer is excellent, too. Thanks to this workshop, it gave me confidence. I loved how the Speaker delivers and holds the training. Well-done, Ms. Sheila of TalkShop! Everything is great! Thank you Talkshop, truly the best! It’s a very helpful and educational training from TalkShop. Both the workshop and Ms. Sheila are excellent. I learned so much from the Social Graces and Fine Dining Etiquette workshop. It is a very useful and insightful training. I like the table manners the most. The TalkShop Consultant is easy to understand with good explanation. It’s an excellent TalkShop workshop that developed my etiquette. 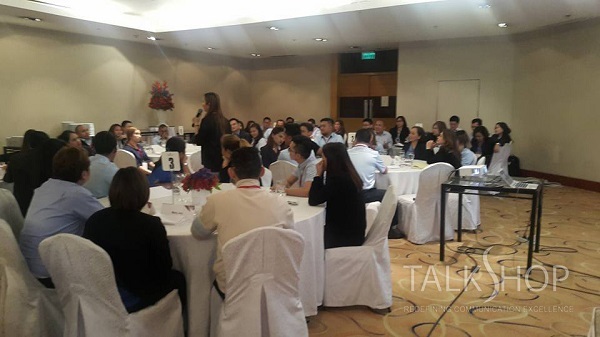 TalkShop workshop in Social Graces and Fine Dining Etiquette is great. I like proper grooming the most. Ms. Sheila Viesca is witty and easy to understand. I am now more aware of formal event and know how to act. I'm giving a rating of 5 for TalkShop. The program design is very helpful in my field. Ms. Sheila is an excellent Trainer. I appreciated the learning from this TalkShop workshop. It was very informative, new and, fun with so many things to learn that is completely relevant to our work. I like good manners part the most. Ms. Sheila is well-versed and captures the audience’s attention 90% of the time. I learned ethics, etiquette, and fine dining. I like fine dining the most from this TalkShop workshop. Ms. Sheila Viesca is great. I actually learned a lot that I can also use even in small party or fine dining. I learned how to answer questions like that in a beauty pageant. I like the proper etiquette in eating and the 8 clothes to wear. Ms. Sheila Viesca, Social Graces Coach is nice and very friendly. I had so much fun and new learning from TalkShop Speaker, Ms. Sheila Viesca. The design is on how to eat in a fine dining restaurant. The Speaker is excellent and very informative. The workshop taught us how to deal with people if invited for fine dining. 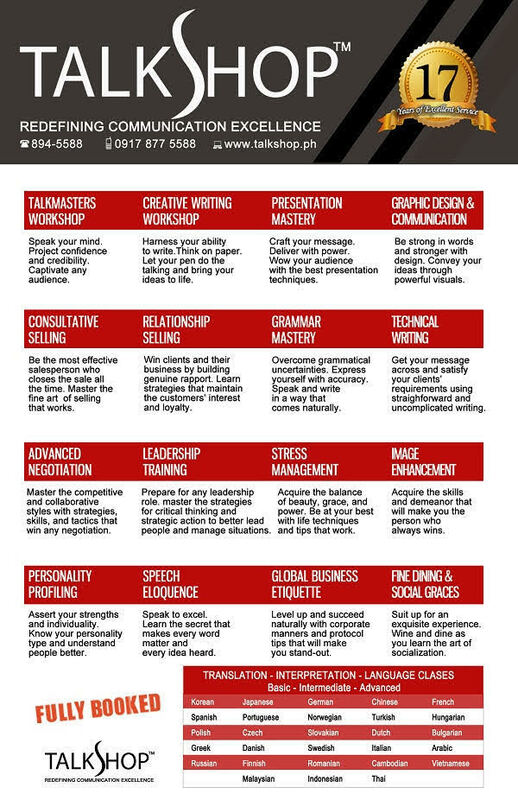 I’ve learned a lot from TalkShop workshop and it’s all helpful especially in our work. I’ve learned the right etiquette and attitude when in fine dining. The areas I liked the most is how to wear decent wardrobe and how to put a tie. The trainer, Ms. Sheila Viesca is very patient in answering our questions. The session will be very helpful especially for us because we get to deal with customers all the time. The trainer gave very useful and practical applications and knows the material very well. My realization is that when making a good impression, a good visual has a big effect. I’ve learned a lot in this TalkShop workshop. It is an excellent one. It was very helpful for us because we meet professionals. I like grooming and dining etiquette. The Speaker, Ms. Sheila Viesca is very effective. I really enjoyed the lecture. She educated us with proper etiquette in fine dining. The program design is so informative as we learned the proper etiquette in eating food and in talking with people. It also taught us how to answer questions spontaneously using 3 key points. Ms. Sheila Viesca is really informative. This workshop really helps us to look more professional. I learned a lot especially how to dress in a corporate way. The TalkShop Speaker is excellent. TalkShop’s Speaker, Ms. Sheila Viesca is clear and concise. She’s well-versed. I learned so many things from this TalkShop training. I like the wine tips the most. I was able to evaluate myself if I am doing the right thing. It’s an excellent TalkShop workshop with an awesome Speaker, Ms. Sheila Viesca. Ms. Viesca had an impressive talk and CV. She’s flexible and smart in such a classy way. She’s excellent and witty. I learned a lot. I liked the wine experience the most. 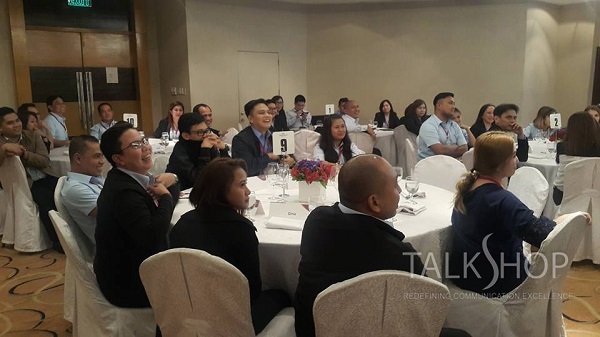 I’ve learned a lot from TalkShop’s workshop in Social Graces and fine Dining Etiquette. The program design is very well-organized. All of the topics are well-explained. The Consultant, Ms. Sheila did a very well-job. I have learned much from TalkShop workshop. The program design is good. I like the questions given for us to answer quickly. Ms. Sheila is well-groomed and a great Speaker. Now I am confident to deal with other people. The TalkShopworkshop is more on personality and appropriate dressing. I’ve learned so much from the training like things that we are not aware of and norms as well. It guides me to be aware of every action I make. The program design is simple and easy to understand. Ms. Viesca’s talk was light and breezy making it more fun for us at the same time comfortable that made us participate. I like the workshop about table manners and proper way of dealing with others. It’s good for personal training. 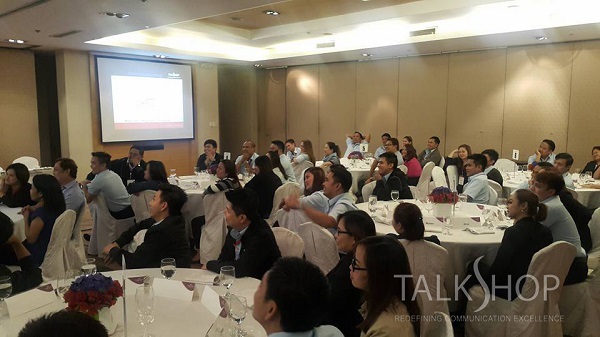 The TalkShop Consultant elaborates important points on Social Graces and Fine Dining Etiquette. I learned the essence of table manners and mingling with other professionals. I like the proper attire when attending events the most. 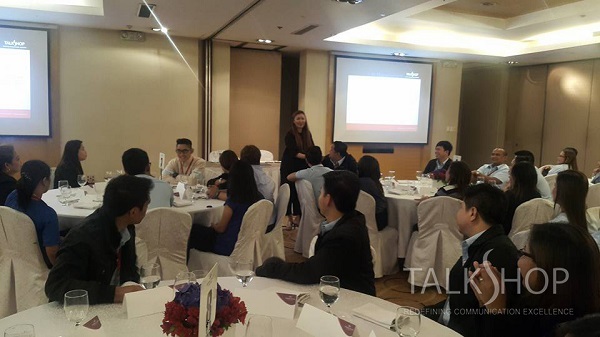 Ms. Sheila delivered all the details clearly in this TalkShop workshop. Sheila Viesca is the CEO and Founder of TalkShop. She is also a Corporate Communications Guru, Personal Development Coach and Leadership Trainer to top corporations and government institutions. Speak your mind. Present effectively. Sell anything. Blog Site of TalkShop. Powered by Blogger.